Happy New Year everyone! I hope you have had a lovely time celebrating with friends and family. reflect on how things have gone. I also like to write up my new goals for the year ahead. and the need for a fresh start. I can be pretty good with my money in general but I did a lot more spending than saving in 2015.
and we have just forked out for a new hoover in the Sales. There was also the holiday to Isle of Wight. We will be booking to go away in 2016 but I also want to make saving a habit. I want to start saving between £10-£20 a week if I am able to. and also this will help us to use up what we have in our cupboards, fridge and freezer hence saving money. Not just with my personal life but also my blog. I have this very cute sprinkle of glitter one. I also want to be more organised around the home. things so being more organised is key. I don't read as much as I use to. My free time is mostly cleaning and tidying up when Blake is napping. as its something I love to do and has always been my main hobby. I want to go more places as a family so more trips out. a trip to the zoo or farm or just a walk around the lake that's nearby. I've not been aboard since I was 15 which is nearly 11 years ago. We didn't get a chance to have a honeymoon after we marred in 2012 as at the time we just couldn't afford it. if anyone has any family holiday recommendations? What are your new year goals/resolutions if any? We not too keen on beach holidays so looking for somewhere warm but where we can go on day trips. 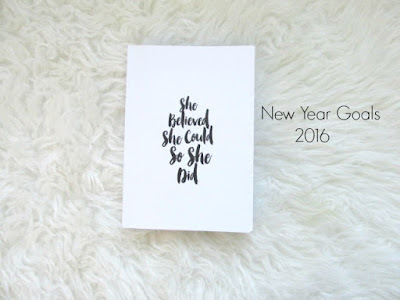 These are some lovely goals for 2016. I hope you achieve every single one. My main goal I think is to lose weight and I have a lot of blogging goals too. Some great goals for 2016, i hope you have a wonderful year. I share a few of them with you, being more organised both at home and with my blog and also trying to save money. Saving is so hard but am determined. Hoping organisation will be easier I have got a book arriving called the magic of tidying up which will be interesting. I started working as a coach (read, life coach) this year and one aspect to hugely increasing the likelihood of you achieving your goals (besides telling others - which you've already nailed here) is figuring out WHY they are so important for you... Why is saving money important for you? ...What do you want to achieve by doing that? ...Why is being more organized important for you? ...How will being more organized change your life?